Projects - Clemens & Associates Inc. The foothills around the Santa Fe Opera are the backdrop for some of the most spectacular views of both the Jemez and Sangre de Cristo mountains. So, when Catherine of Clemens & Associates Inc. was chosen to redesign this residence’s exterior spaces (on the tail end of a major home renovation), she knew the end result must be equally awe-inspiring. Catherine created a design that distinctly blends an aura of antiquity with Moorish architectural elements, framed vistas, exquisite accents and lush plantings into a sublime mélange of comfort and signature style. The centerpiece—and most challenging aspect—of Catherine’s vision was the existing pool courtyard. It originally featured a brick surround that was framed by a sunken area that abutted two portales on either side of the pool. 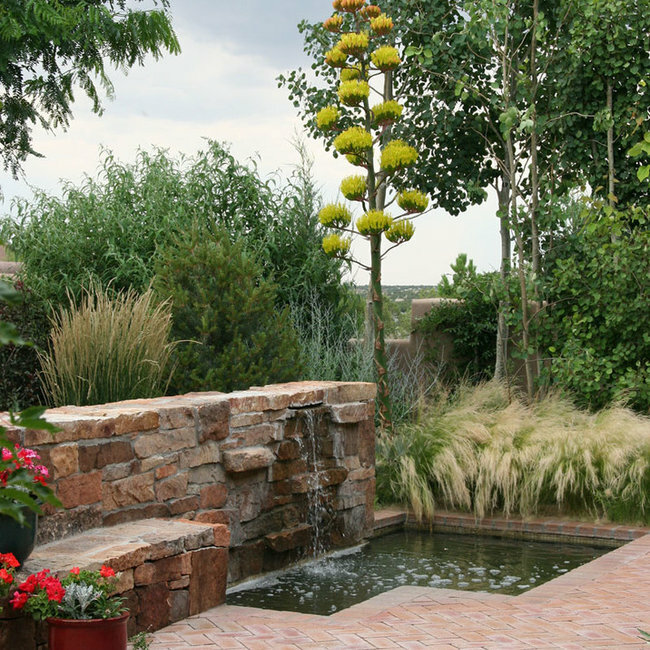 Catherine recommended raising the pool area to create a seamless, leveled flow of tumbled bricks across the space. An adobe wall was added to the courtyard’s open end for the purpose of maintaining the view of the mountains, while blocking the road for enhanced privacy. 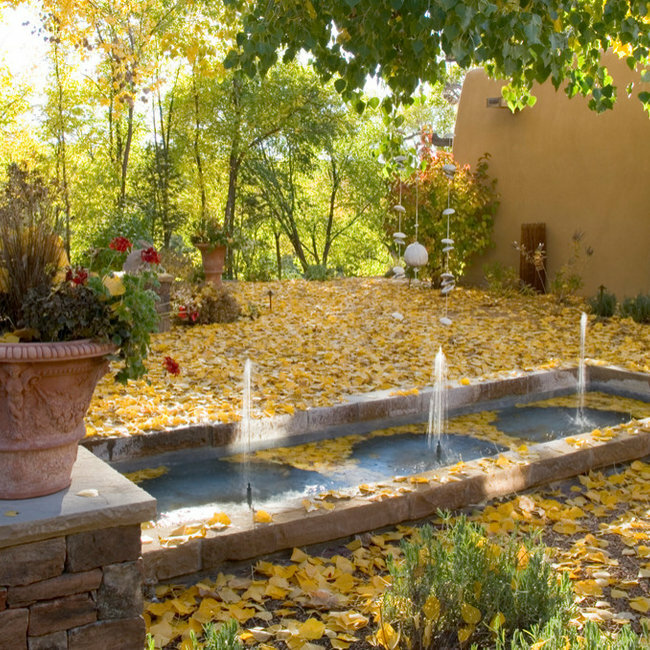 A water feature consisting of an adobe wall accented with hand-painted tiles and a marble bowl hand-carved in Italy was also added for dramatic effect. As with the other exterior spaces, the pool is framed by many attractive containers featuring shrubs, perennials and annuals. 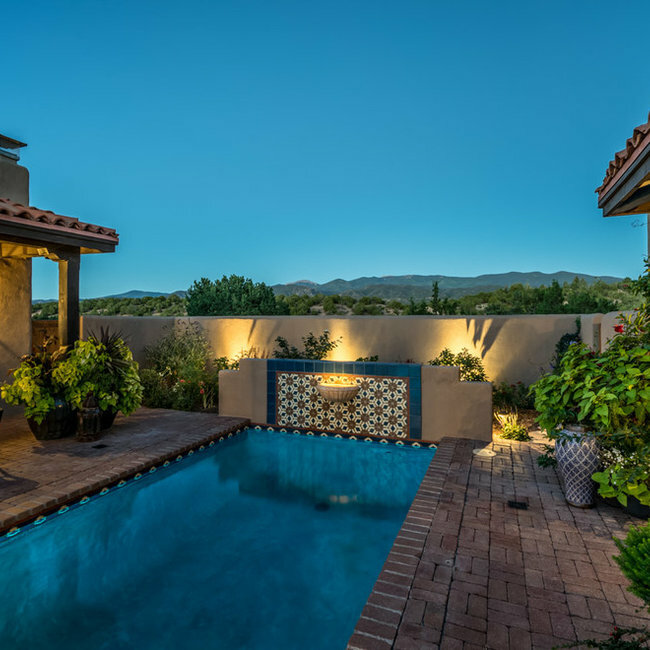 Adjacent to the pool area is cozy circular seating area built into the hillside and consisting of an alcohol-fueled fire pit, flagstone paving, ample seating (featuring custom cushions) and perennial beds. 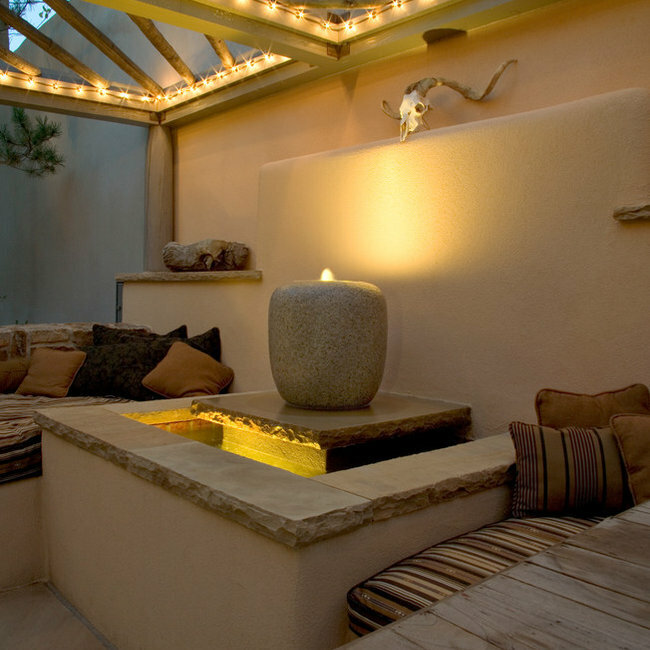 This rustic, yet well-appointed space is a perfect setting to enjoy the expansive New Mexican skies and starlit nights. 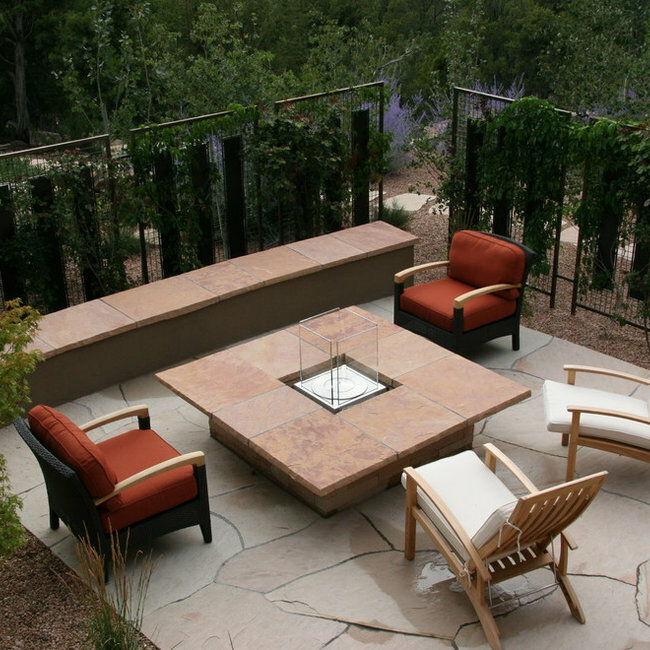 The design objective was to create a usable outdoor room with strong lines drawn by interesting, natural materials. 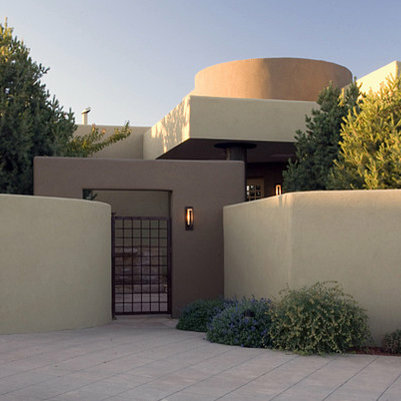 A simple, arched brush-stroke shape is repeated in the curve of the corrugated roof, spa handrail, and decorative window grill. The semi-circular steel element behind the spa is designed to support the bulky spa cover for ease of use. 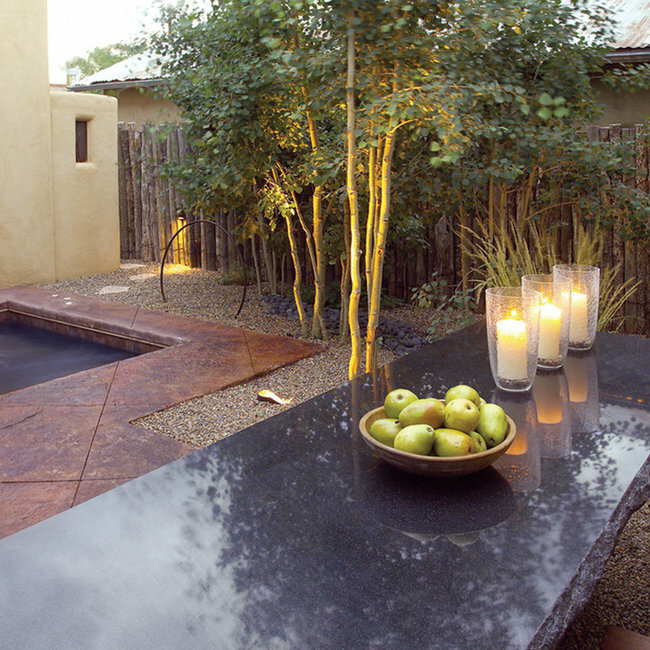 A polished, black granite table was installed on a custom fabricated steel base. The sky is reflected in the table top giving the appearance of a raised pool of water that mirrors the spa. 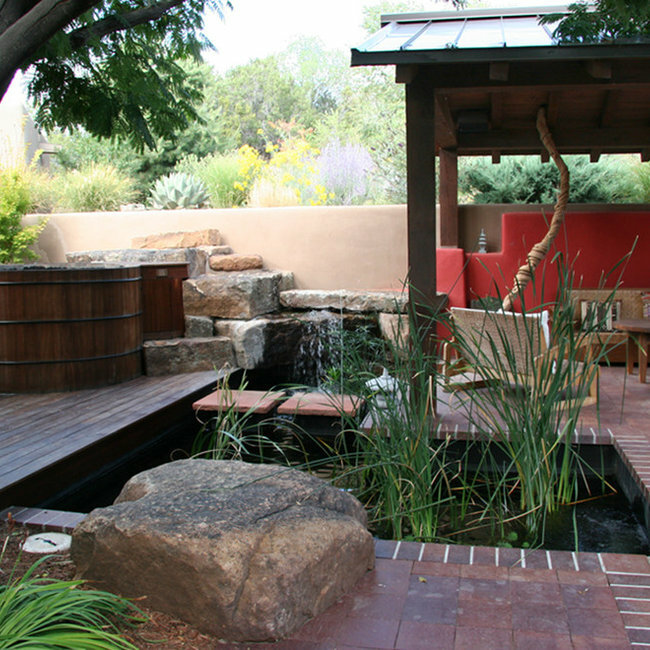 The paving is colored-stained concrete and the pool plaster is black to lend a sense of contemplative depth. The ipe wood and steel furniture pieces were designed to repeat the graceful shapes of the architectural elements. 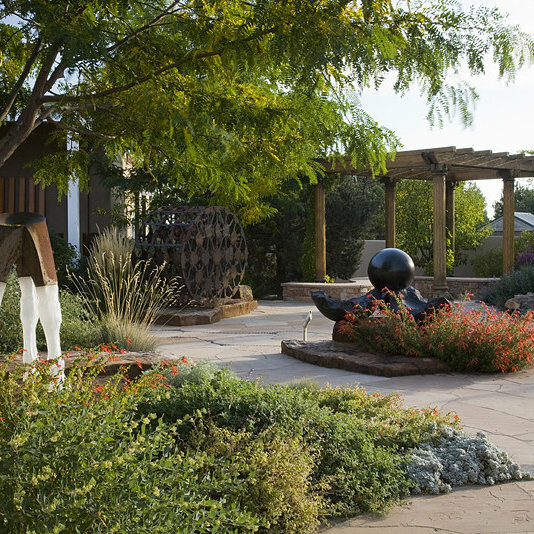 This project is a wonderful example of our firm’s philosophy of creating interesting and beautiful outdoor living spaces that are environmentally sensitive to our dry climate. The designer's intent was to create an Indonesian-inspired pavilion that appears to float over the water's edge. 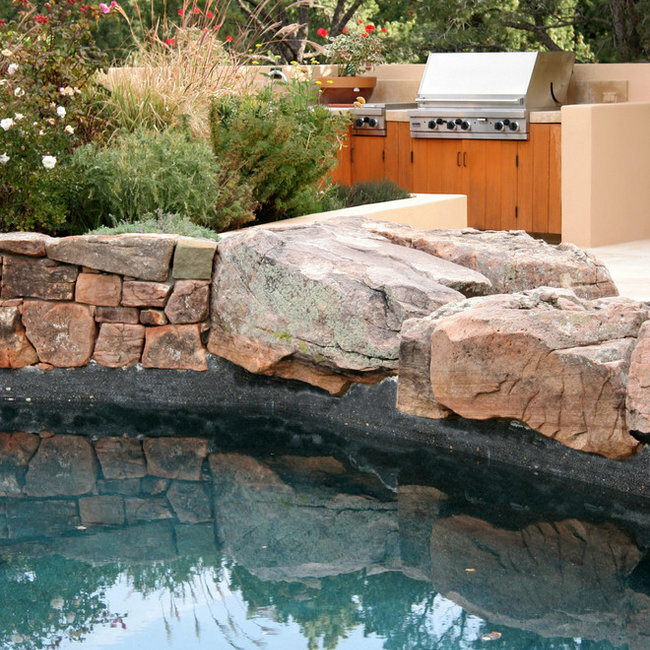 Hand-picked boulders were fit and set to create the setting for the Jarrah wood hot tub. The architectural elements appear as though they were built against an existing rock out-cropping. 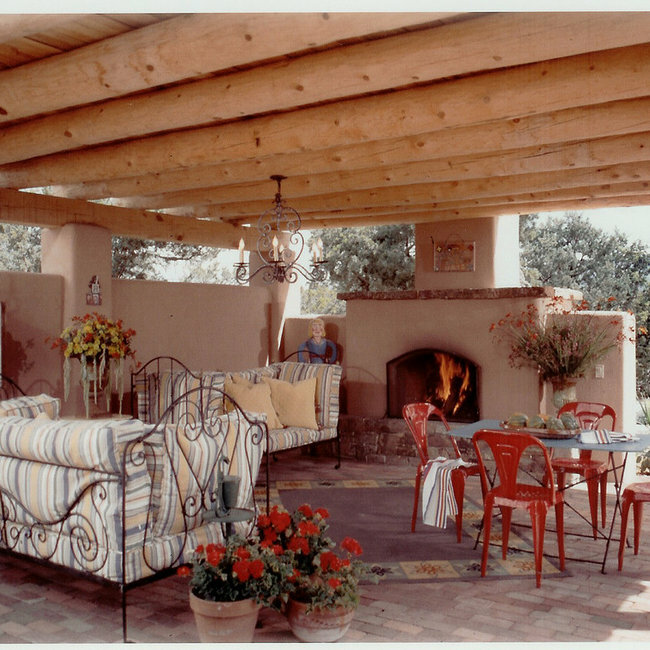 The back wall of the pavilion was stuccoed a deep carnelian color and a coral-bark maple was planted behind the tub that mirrors the stucco color. Square, hard-fire bricks were used as the paving. Stacked stone slabs create the flared steps for spa access. 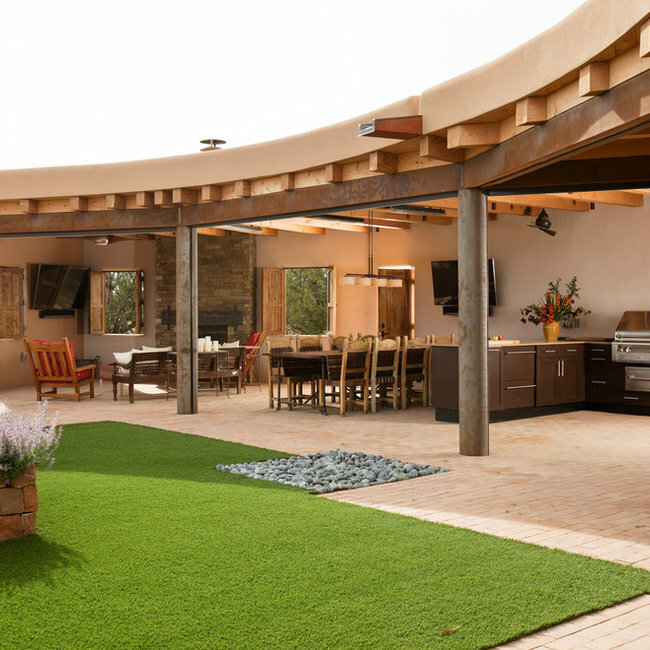 A full service outdoor kitchen/ dining space/ living room with contemporary southwest styling lets a Santa Fe couple and their extended family take advantage of the beautiful New Mexican landscape and weather. Infrared heaters, ceiling fans, and sun shades keep the space comfortable during warmer days and cooler nights. Mounted outdoor-rated TV's and a gas fireplace complete this family-ready hangout and make a perfect setting for entertaining guests. For this project, the main outdoor living areas were designed to showcase the property's views and the natural vegetation was retained as much as possible to honor the context of the site. The existing grade change offered by the site provided opportunity for drama. In order to enhance the harmonious program between the indoor and outdoor living spaces on this unique property, the architectural context of the landscape was integral to the design. The guiding architectural principal is a single radius point from which most of the lines of house emanate. The lines are clean and contemporary and yet the materials are soft and elegant. For the landscape, we chose to take advantage of these elements, in particular gentle curves and wide-angle perspective the architecture presented. Ruddy-red accent walls define the master bath vignette and begin your garden tour through a series of patios that echo the curves of this Summit home. The spa serves as an elegant focal point outside the master, and a fire element punctuates a gracious seating area perfect for summer evenings.